Since Mardi Gras (an officially recognized and celebrated holiday in this family) has come and gone...Easter is fair game. We are big on holidays around here....which means, anyone I can hold down long enough to dress as such will look the part. 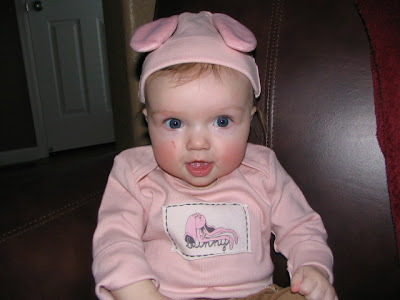 Here is Lainey in her new bunny shirt from one of my favorite childrens' stores, BabyStyle. A store just arrived in our mall and so we're thrilled about that!